Our new agreement with the China Scholarship Council (CSC) will attract high-calibre PhD candidates from China. 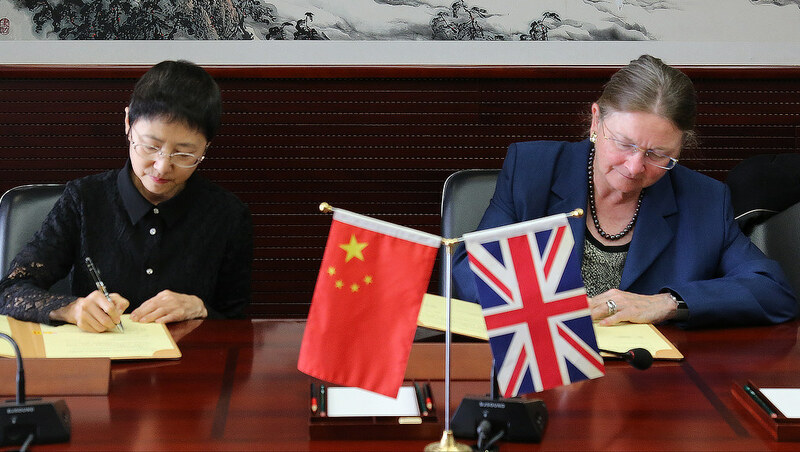 Dr Liu Jinghui and Professor Dame Glynis Breakwell sign the agreement. The University is pleased to announce a new agreement with the China Scholarship Council (CSC), establishing a joint scholarship programme to attract top PhD candidates from China. Signed by the Vice-Chancellor and Dr Liu Jinghui, CSC Secretary-General, in Beijing on 20 October 2017, the agreement paves the way for new links with prestigious Chinese universities and research institutions in areas of shared research excellence and will see the University deepen our relationships with our strategic partners in the country. Selected Chinese applicants will be able to complete full-time PhD studies at the University of Bath for a period of up to 4 years. CSC will provide for travel and subsistence with the University of Bath providing a full tuition fee waiver for each successful student. Under the agreement, up to 10 new scholarships will be supported. Applications are invited from any field of study, however, projects aligned with key areas of research excellence at the University are more likely to be successful. The China Scholarship Council (CSC) is a non-profit institution affiliated with the Ministry of Education.